The MoreKeyboard is an innovative large key and large-print computer keyboard. It is designed to benefit older persons, the physically and/or vision disabled, larger framed and athletic people, children and those whose work requires wearing gloves. 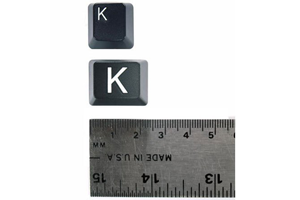 The MoreKeyboard’s letter and number keys are more than 25% wider than those of standard keyboards. 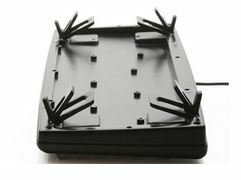 The larger landing area on the big keys helps with locating and operating the keyboard and is a perfect solution to enable users to type with more accuracy and confidence. The larger landing space is beneficial to new users (young or older), those with physically disabilities, those with large fingers/hands and computer users who wear gloves while inputting data. 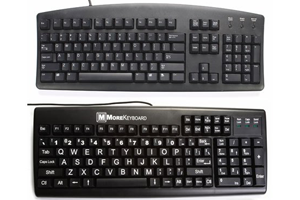 The large print on the number and letter keys of the MoreKeyboard are three times larger than those on standard keyboards. The bright white printing on the large black keys increases visibility and contrast making the MoreKeyboard easier to read. This is helpful to those with vision impairment and for those who wear reading glasses or bifocals, or work in low-lit areas. The MoreKeyboard is designed with a multiple leg system and front and back legs, which have three different height adjustments. This allows the user multiple height and angle adjustments to achieve a more wrist neutral position. 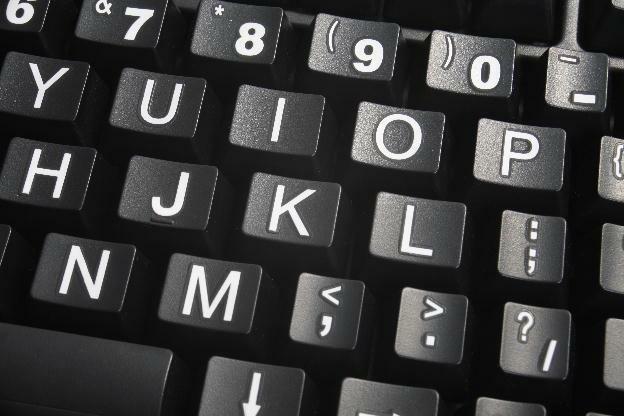 Seniors: A big key keyboard and easy to see lettering is the perfect solution to enable seniors or older persons to type with more accuracy and confidence. Physically Challenged: Those who are physically challenged may experience both vision and coordination (dexterity) challenges. The big keys and easy-to-see lettering will enable them to improve their skills in both of these areas. Children: The larger easy-to-see and find keys are better suited for the motor skills of young children who are eager to learn and play on the computer. 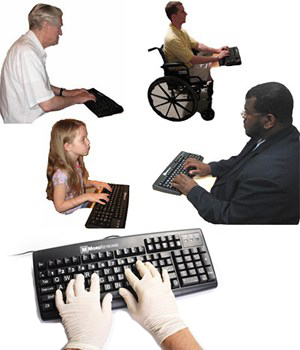 Larger Framed / Big Hand users: Individuals with larger hands require more space on their keyboard in order to enter data correctly. The MoreKeyboard addresses this challenge by having 25% larger keys, which provides a larger landing surface than the standard keyboard. Lab/shop users: Those who wear protective gloves at work or work in low-lit areas understand the hassle and inconvenience of entering data accurately on a computer. The large letter and number keys enable the user to increase accuracy without having to remove their gloves (or use additional lighting). The U.S. Equal Employment Opportunity Commission said charges of job bias related to disability hit an all-time high. Apple’s latest version of its mobile operating system, iOS 10, includes several new features for those with visual impairments. Controversial, last-minute changes proved too much for a bill designed to provide tracking devices and other resources to those with developmental disabilities at risk of wandering. No Matter The Requirement It Suits Everyone.